Closing Reception February 7th from 3 to 6pm. The Box is pleased to present the first collaborative work of choreographer Melinda Ring and artist Jennifer Nelson. The artists will attempt with all sincerity, to create art and choreography that is “for the birds.” Twenty-one birds will be living together with the artists in the gallery for a twenty-one day exhibition. Twenty-one days for twenty-one birds. This project developed through a year-long conversation via instant messaging between NYC and Athens, Greece. The artists decided to explore the possibilities of artistic inter-species communication with creatures having different systems of perception, social organization, and narrative. Attempting to orient themselves towards an “other”, to de-center themselves, the artists will bend their minds toward the birds instead of requesting the opposite—that the birds interact with them in ways similar to humans. Their aim is to work throughout the exhibition to make things in the gallery that appeal only to the birds’ sense of sight, the birds’ appreciation of vertical space, and the birds’ social organization. Ring and Nelson also wonder if attempting to find a cultural language for something perceived as "other" may be a useful model for people on this planet trying to live together. They understand that such a desire (to create art for the birds) may potentially be futile and absurd, but hold out for the possibility that perhaps it is not; that perhaps it is both possible and of benefit. 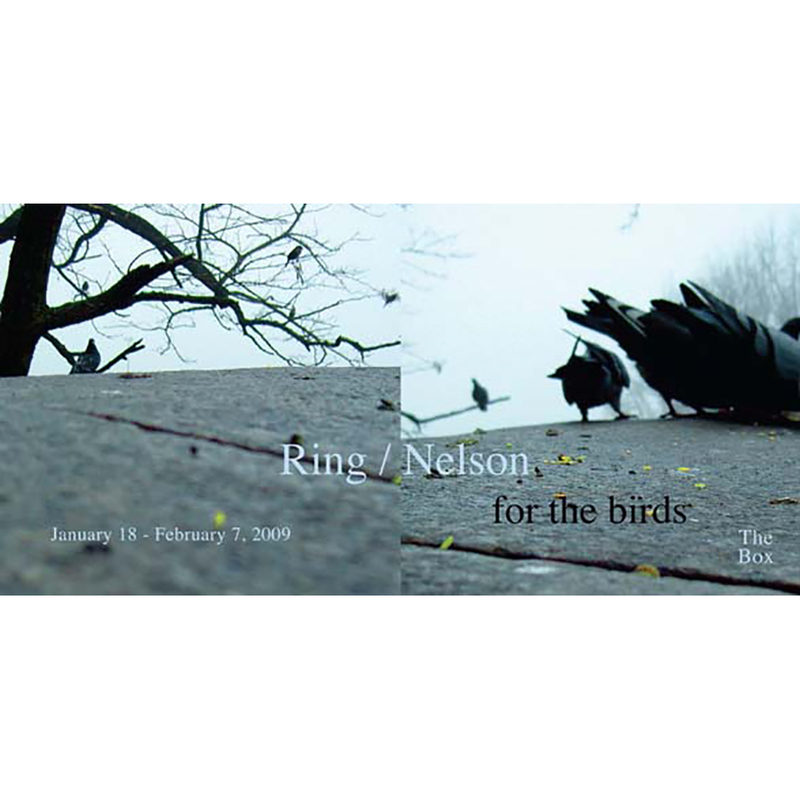 Ring and Nelson are creating choreographies in the broadest sense of the word. They consider choreography to be the dynamic juxtaposition of human and avian habitats, the fixed and changing organization of the space, daily and poetic activity (like the feeding of the birds), interaction with volunteers, and the transformation of thought over an extended duration. The artists will be working on choreographies and visual communications in the basement that will sometimes include other performers who have been invited to participate in this experiment. These daily attempts will be recorded on video and broadcast on monitors mounted for the birds’ view. Bird enthusiasts have also been invited to act as inter-species liaisons. Ring who was born and raised in Los Angeles, is a choreographer whose work is informed as much by the concerns of experimental work in visual art, film, and theater, as it is by developments in new dance. She is a graduate of Bennington College (MFA, 2001), and UCLA (BA, 1982). Ring, who moved to New York City in September 2001, is the Artistic director of Special Projects a production company that supports the creation of dance and movement based art projects. She regularly collaborates with visual artists, most recently Huh? (2007), a performance was made for Martin Kersels’ sculpture Rickety. This piece was originally commissioned by, and shown at The Tang Teaching Museum at Skidmore College; it was reprised at The Santa Monica Museum of Art in November 2008. For the Spring 2007 Movement Research Festival – Ring curated The Salon of Found (and Stolen) Dance, an evening of live demonstration, video footage, performance and conversation around the topics of appropriation, inspiration, transformation, and stealing. This event was repeated at Farmlab in Los Angeles in September 2007. With the help of a Dance Theater Workshop Outer/Space residency grant and the Mabou Mines/Suite Resident Artist program, Ring spent fall ’08 developing the dance, Hmmm..., which will premiere at The Kitchen in April 2009. If you have any questions please contact Mara McCarthy, Director of The Box at info@theboxla.com or 213 625 1747.